I'd like to start off with saying thank you to everyone for your continued support. We've had over 81,000 installs at the time of this post and I'm very happy about that. We have never been concerned with being the best. We just want to put out a fun pack for people to play. 1.12 is here and we are excited to announce we will be moving away from 1.10 as soon as possible. Limiting mods that add dimensions. Removing mod spawn/or require mass entities. Reducing the amount of overall mods. I would say the two most used mods that will be removed from future versions will be Chickens + addon mods, and EnderIO. Two great mods in theory. Chickens added a fun alternative to mining or magical means of resource gathering. The issue lies in selfish players for the most part. Players on servers generally ignore picking up the waste produced by the chickens. Players also feel the need to have dozens upon dozens of each chicken type inducing server lag. EnderIO is a server killer. It has amazing routing, filtering, etc. But the mod is poorly optimized. The conduit bundles cause an insane amount of lag that we and other pack authors haven't seen before. I myself am at that point where I'm tired of using the same mods in every pack. Why play one pack over the other if its just the same mods re-branded? I think its time to focus on some of the lesser known mods and try to shed some light on them. Of course quality and performance will still take precedence when choosing mods for the pack. This does not mean popular mods will not be in the pack. There will be a balance to new mods and old. 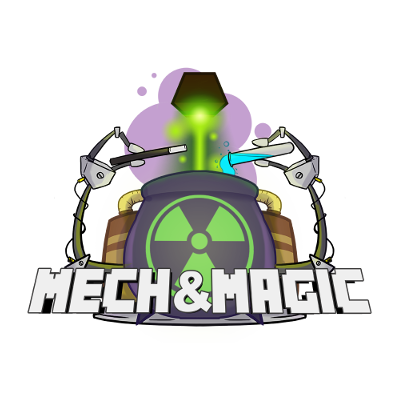 As usual we will be doing our best to add and tweak balance to Mech & Magic. I have never liked packs that give you everything day one. Recipes will be altered immensely. Configs will be tuned for balance. Mod compatibility will be tuned for balance. I have been toying with a game-mode for those that may enjoy a little more grind. Harder recipes mostly but that is not a final thought yet. I started as a server owner back in the Tekkit days and still host the Official server myself so server performance is always a big concern with me. Before I release a version I always test it with the latest Sponge build as thats what we use and thats what a lot of larger servers use. Some people do not want to use Sponge or do not want to learn it or other methods of plugins. So we will be adding FTBUtils to the pack finally. We wanted to do it awhile ago but certain mods in the pack did not play well with the newest version and I wasn't going to remove those mods just for FTBUtils. We hope that you continue to enjoy the pack and feel free to give us any ideas or mods that you might like to see in the newest versions! We have decided to integrate FTBUtils in the pack. When you receive it the files will be pretty raw and it will be up to you as the server owners to configure it for what you want out of your server. The official server configs will be available for download on our website when ready if you would like to use, reference, or alter them for your own server(s).